The Atlanta Braves open the 2019 campaign on the road in Philadelphia Thursday afternoon ahead of the ballclub’s home opener on Monday. Derek Schiller, president and CEO of the Braves, said the organization feels good about the team they will be fielding this year. The defending NL East champs added slugger Josh Donaldson in the offseason and signed former Brave Brian McCann, bringing the catcher back to Atlanta. Also returning is reigning National League Rookie of the Year Ronald Acuna and several young standouts from last season, including Marietta native Dansby Swanson. The roster wasn’t the only thing expanding in the offseason. Schiller pointed to several new attractions coming to the Battery Atlanta this year, including cigar bar Burn by Rocky Patel, outdoor gear store Rock/Creek and vinyl record shop Waterloo Sunset Records. 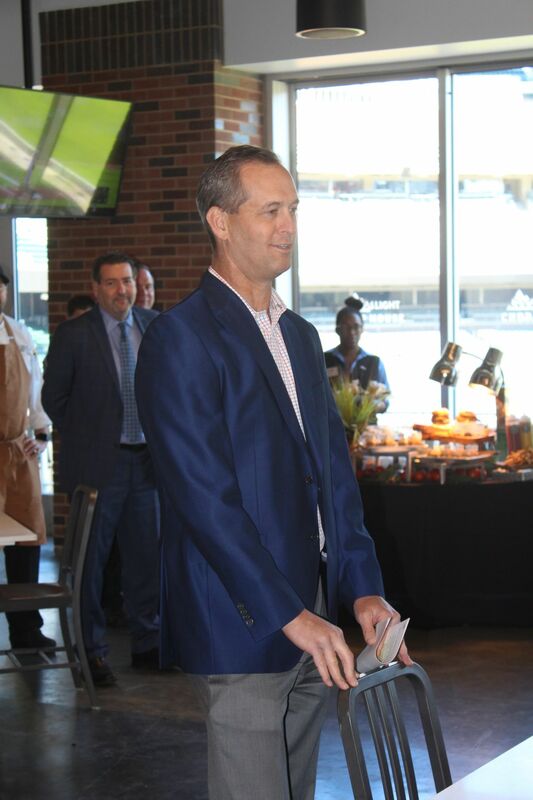 The ballpark’s concession menu will also see some additions this year, Schiller said. For example, the new Blooper Burger stacks four cheeseburger patties, a foot-long hot dog and chicken tenders under a bun branded with the Braves’ mascot’s name. Also new this year is the so-called “Best Darn Steak Sandwich in Baseball,” featuring sliced beef tenderloin, balsamic glazed arugula, roasted portobello mushrooms, crunchy fried onions and creamy blue cheese sauce. SunTrust Park itself saw some changes in the offseason, Schiller said. The Holeman & Finch Burger stand moved from the top level of the Chop House to right outside the Chop House and will be accessible from outside the ballpark even when the Braves aren’t playing, and the Terrapin Taproom is expanding its seating capacity and adding a new outdoor bar. Schiller also addressed the low-priced concessions at Mercedes-Benz Stadium in Atlanta. The stadium, home of the Atlanta Falcons and Atlanta United FC, cut prices again this year, offering fans hot dogs for $1.50, a soda for $2 and chips and salsa for $2.50. Schiller also pointed to various packages that include tickets, food and drink that fans can take advantage of. Monday’s home opener is sold out, but there are still some standing-room-only tickets available, Schiller said.